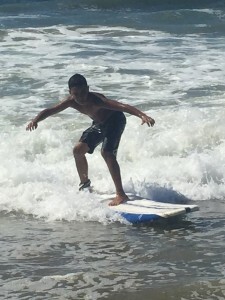 This past weekend Walk Was Sally was able to go beyond mentoring….Thanks to the generosity of our donors and sponsors, WWS offered two of our mentees the incredible opportunity to learn how to SURF! This past summer WWS partnered with the Jimmy Miller Foundation to give our mentors and mentees a fun-filled day of surfing. 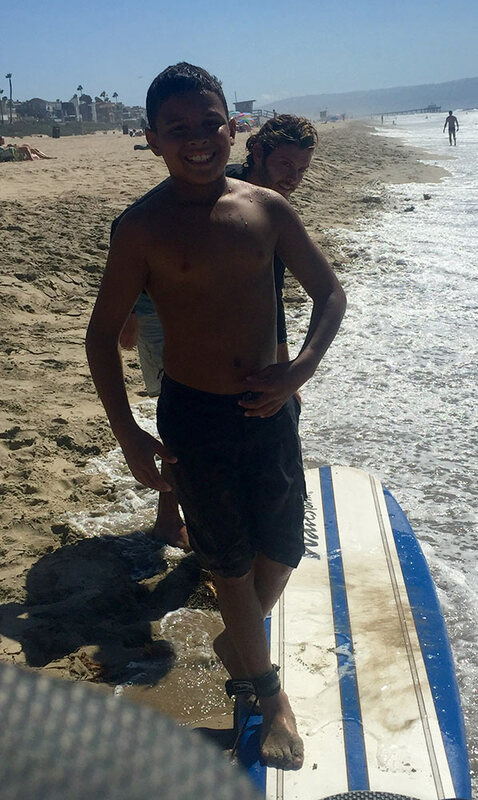 Throughout the day we witnessed many of our kids come out of their shell, and a few showed a lot of promise in their surfing ability! It was after seeing the joy on their faces that we knew we had to get them back on the water. With the help of Camp Surf, we were able to offer two of the surf day stand outs THREE private lessons, so they could continue this journey. This past weekend I got to see one of these mentees in action. After just a few minutes, you could see that Tayvian (13) was a natural. I hope he hadas much fun surfing as I had watching him do it. This entry was posted in Mentors & Mentees and tagged camp surf, cancer, jimmy miller, mentees, mentoring, walk with sally.